I did NOT eat a piece of Strawberry Cake and Death by Chocolate at Eater dinner. NEVER. Especially when I am trying to lose the last of the baby weight (and by the way, the baby is NOT almost 15 months old) Not ME!! I am NOT in denial at all that my BABY is walking. She is NOT walking (even though she can go across the room on two legs without falling). She is a baby and can't walk yet. NOT ME. I would NEVER be in denial about such important milestones only to keep her "my baby" forever!!!! I do NOT sneak chocolate eggs when nobody is looking. I would NEVER EVER do that. That is soooo Not me!!! My family and I did not miss church on Sunday (especially Easter Sunday). Not US. I most certainly did not bribe the Red Head with candy so that she would NOT wear the horrible headband my mom bought her (sorry mom). It really didn't go with her outfit. Not me. I NEVER resort to bribery with food. I did not bypass all of the healthy foods, salad, veggies at Easter dinner and instead load up on mashed potatoes and macaroni and cheese (ohhhh sooooo good!!!). 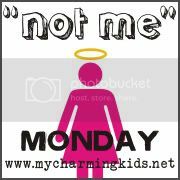 Not me! Thanks for stopping by and seeing what a PERFECT mom and dieter I am!!!!! Ha!!! i don't want my baby to grow up either,, and wold have been happy if he had never learned to walk, and stayed under a year old...(i don't plan on any more) they just grow up to fast. You'll lose the last of the baby weight, don't give up!